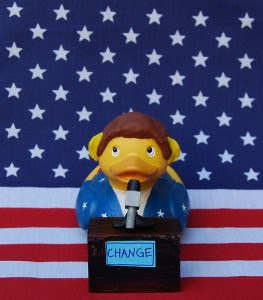 ARRA News Service: What does Lame Duck mean in Politics? What does Lame Duck mean in Politics? * the abolishment of the office, which must nonetheless be served out until the end of the official’s term. Lame duck officials tend to have less political power, as other elected officials are less inclined to cooperate with them. However, lame ducks are also in the peculiar position of not facing the consequences of their actions in a subsequent election, giving them greater freedom to issue unpopular decisions or appointments. Examples include last-minute midnight regulations issued by executive agencies of outgoing U.S. presidential administrations and executive orders issued by outgoing presidents.Such actions date back to the Judiciary Act of 1801 (“Midnight Judges Act”), in which Federalist President John Adams and the outgoing 6th Congress amended the Judiciary Act to create more federal judge seats for Adams to appoint and the Senate to confirm before the Democratic-Republican Thomas Jefferson was inaugurated and the Democratic-Republican majority 7th Congress convened. In more recent history, U.S. President Bill Clinton was widely criticized for issuing 140 pardons and other acts of executive clemency on his last day in office, including two former close colleagues, donors, fellow Democratic members and his own half-brother. Origins of the term: The phrase lame duck was coined in the 18th century at the London Stock Exchange, to refer to a broker who defaulted on his debts.The first known mention of the term in writing was made by Horace Walpole, in a letter of 1761 to Sir Horace Mann: “Do you know what a Bull and a Bear and Lame Duck are?”In the literal sense, it refers to a duck which is unable to keep up with its flock, making it a target for predators. Tags: lame duck, lame duck Congress, politics, To share or post to your site, click on "Post Link". Please mention / link to the ARRA News Service. Thanks!